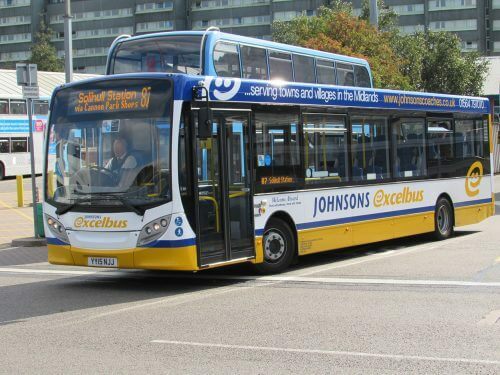 Johnsons Excelbus, part of Johnsons Coach and Bus Travel, has recently won a block of tendered services on the Solihull to Coventry corridor from Transport for West Midlands (TfWM). From the 25 February service 82, operating between Solihull and Coventry via Catherine de Barnes, Hampton in Arden, Meriden and service 88 operating between Solihull and Balsall Common via Knowle, Chadwick End, JLR Fen End will commence operation. In addition, service 88A will also be introduced and operate directly between Knowle and Balsall Common. Service 87, which is already operated by Johnsons Excelbus, will be re-routed to serve JLR Fen End between Knowle and Balsall Common. This contract will add six new Euro VI buses to the fleet. Three are Alexander Dennis Limited (ADL) Enviro 200 Classics, converted by Baumot Engineering to Euro VI from Euro V, with the other three being ADL Enviro200 MMCs. The new buses will run on the 82 and 87/88 routes starting on 25 February. Martin Dempster, Johnsons Bus Manager, said: “This is great recognition of the high standards we deliver each day with our network. Our bus team is immensely proud of the reputation we have built for customer service and reliability. Also from 25 February, Johnsons Excelbus will be making changes to services in the Redditch area. Services 64 and 350 will be withdrawn and replaced by a simplified 150/150A service. This will provide the much requested reintroduction of connections from Birmingham, through Redditch towards Worcester. Johnsons Excelbus is to also remove the limited stop nature of the service into Birmingham and therefore services 150/150A will observe all stops. Operations Director Peter Johnson added: “After a period of consolidation with our bus business our PVR will move from 28 to 31 from 25 February.